The former fire station site in Loansdean, Morpeth. 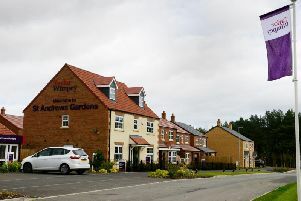 The response by a key county official to concerns about the drive-thru element of a proposed retail development in Morpeth has been criticised. Morpeth First School is set to be re-located to an area in front of the current County Hall buildings. An application for new housing on a different part of the site has been submitted and a bid has also been lodged for a retail scheme on the former fire station and Merley Croft sites. This includes a drive-thru restaurant and the headteacher of Morpeth First School wrote to Daljit Lally, Northumberland County Council deputy chief executive and Northumbria Healthcare NHS Foundation Trust executive director for well-being and community health services, to raise concerns about its potential impact. According to the South Morpeth Coalition (SMC) opposing the commercial and housing projects, she said that ‘there is not an identifiable educational reason to object’. The group also says that Mrs Lally stated it is the responsibility of parents and the school to ensure the children are taught the benefits of healthy eating. The response has shocked the school’s chair of governors and SMC member Coun Joan Tebbutt. She said: “The position taken by Mrs Lally is disgraceful and I don’t think there is another local authority in the country that would adopt this stance in relation to a new-build school. “It flies in the face of recognised guidance and policy already introduced, or being introduced by other local authorities on restricting fast food establishments near schools. “There are also inaccuracies in Mrs Lally’s response, including the suggestion that local authorities which have implemented fast food exclusion zones around schools have only done so for secondary age children. “St Helens Council has a policy in place that prevents hot food takeaways within 400 metres of primary schools, secondary schools and sixth form colleges. Waltham Forest has a similar policy, as does Barking and Dagenham. “The county council has no such policy, nor any plans to introduce one. The proposed commercial scheme also includes retail floor space, a food store and a family pub/restaurant. A county council spokesman said: “As this is an active planning application, we aren’t able to comment further at this stage.